"Have you seen The Walk?" "Its a true story about a French man who tightrope walked between the twin towers." "Oh... The twin towers? Those twin towers?" 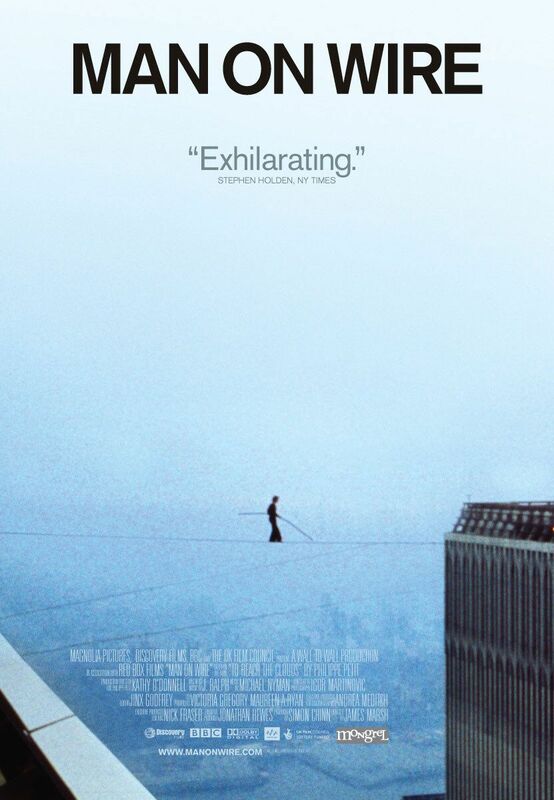 Incidentally Man On Wire is a great companion piece to this film, as it includes real footage of Philippe walking, running and even laying down on wires. More importantly it includes Petit's own telling of the story in great detail. There was a frankly baffling moment in The Walk where while looking for the arrow that was shot to connect the two towers with a string attached, Petit takes his clothes off in frustration. The real Petit confirms that this happened in the documentary, but this isn't explained very well in Levitt's performance or voiceover. The Walk very accurately and at times with the finest detail resembles Petits version of the story. The only notable exception being a performance in Sydney in 1973, and the Australian accomplice he met through this which are left out of the film presumably for time. Levitt looks like a pro every time we see him on the wire and with good reason. He was taught his tightrope walking technique by the now 67 year old Philippe Petit, who correctly predicted this training would take no more than eight days. The rope walking scenes were shot for real at a hight of 12 feet, in front of a green screen. These scenes are spectacular, particularly shots that use a crane camera spinning around and hovering over Levitt. On a couple of occasions I actually felt a sense of dread come over me as if I was looking down at New York City for real. Sitting in my living room I can only imagine what this will look like on the silver screen. 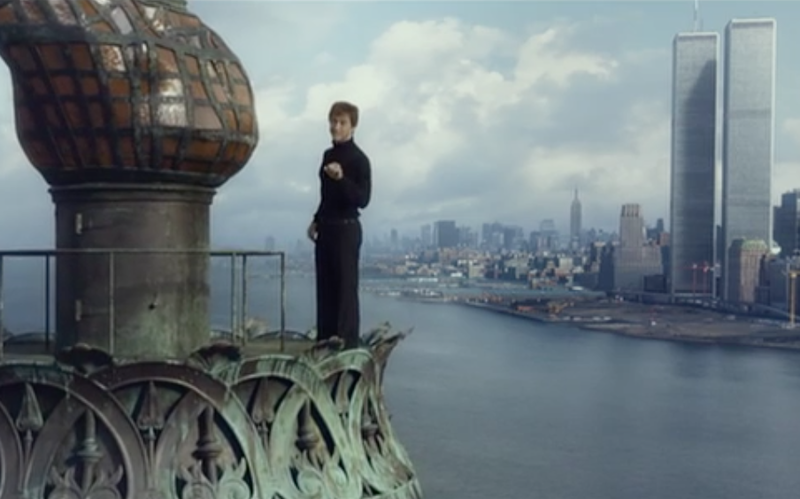 Director Robert Zemeckis was quoted as saying that "the goal was to evoke the feeling of vertigo. We worked really hard to put the audience up on those towers and on the wire." They definitely achieved this goal creating stunning and realistic visuals. While Joseph Gordon-Levitt puts on a great performance on the wire, his french accent was at times patchy. It wasn't quite John Cleese in Monty Python and the Holy Grail (1975), but at points in the film it smelled of elderberries a bit. To his credit though, his french speaking was much better. He is a known Francophile, so is accustomed to the language and already knew how to speak it before filming began. are not explained by the film, almost as if it assumes we know already. This wouldn't be an issue to me if the film wasn't constantly cutting to Levitt as Petit standing on the Statue of Liberty talking directly to the viewer and explaining the story. These felt a little overdone and slightly lazy at times where things could be shown not told, but I understand they were essential to reminding the viewer that they are seeing everything from Philippe's perspective. This is really the only element of the film I didn't like but it at least had a reason to be included that makes sense. One of the things I liked about the Walk is how well paced its 2 hour runtime is. The film divides into three sections, Petit discovering and working towards his goal, implementing the plan of getting all the equipment up to the roof and finally the 'Coup' itself as he repeatedly calls it. Language like this as well as 'accomplice' and 'Spy work' are a constant reminder that what Philippe is planning is technically illegal and this is necessary to add even more danger to the plan. The film at no time feels too long or that it is dragging which is impressive when you are building towards a big visual payoff that everyone knows is coming. The early scenes where Petit recruits his accomplices help with this as they move the story along progressively and are not lingered on for too long. Initially I felt like many of these characters are introduced and are merely window dressing for most of the film, particularly Annie who's main role in the Coup seems to be to watch from below. After watching Man On Wire I realised that the role of each of these people was to facilitate Philippe and not much more, and this no longer felt like a slight on the film. The real life Annie even says "my life was completely consumed by his and he never thought to ask me whether I had my own destiny to follow. It was quite clear I had to follow his." Only when I heard the real Annie say this did I truly understand that Philippe is the only developed character because that is true to the film, which is presented from the first person perspective of Philippe. A perspective that is obsessively focussed on his own dreams. There is one final thing to discuss that I referenced at the start of this review. The film does a very good job of distracting you from thoughts about the other major event in the twin towers history, until one sad and impactful moment in the film. I think this affected me so much because I had been so completely invested in Philippe and his ambitious journey that September 11th 2001 had become the furthest thing from my mind. This is how I think Philippe's accomplices must have felt, fascinated and inspired by this eccentric character that wants only to do something amazing. 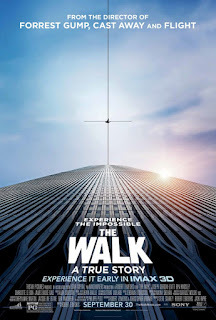 Wakefield Cathedral Film Club will be screening The Walk on Monday September 19th at 7pm. Hail Caesar! Saving Mr. Banks and A Christmas Carol.